1) The sauce is cooked using the double boiler method. Heat some water in a utensil. Bring it to a boil and then simmer on a medium to low flame. 2) Whisk the egg yolks, salt, cayenne pepper and lemon juice in a bowl. 3) Hold this bowl over the heated utensil, making sure it is not in direct contact with the water below. 4) Add the melted butter little by little and stir continuously. 5) The sauce will thicken gradually (it takes about 7-10 minutes). Keep the sauce aside. 6) To prepare the poached eggs, heat some water in a small utensil (the water should fill half the depth of the utensil) and bring the water to a boil and simmer on a medium to high flame. 8) Add the vinegar and make a swirl with a spoon, making sure the water goes around in one direction. This ensures that when the egg is added, the egg whites gather around the yolk in a uniform way. 9) Do not add the eggs directly into the pan, but break them in a small bowl and very gently add the egg to the hot water. Poach one egg at a time. 10) The poaching time varies according to your preference. If you like the yolks slightly runny, 3 minutes should be enough. If you like the yolk a little stiff, poach them for a few minutes more. 11) Once done, remove the poached eggs on a paper towel. 12) To assemble the eggs benedict, slightly toast two english muffins, cut each into two, giving you four portions. 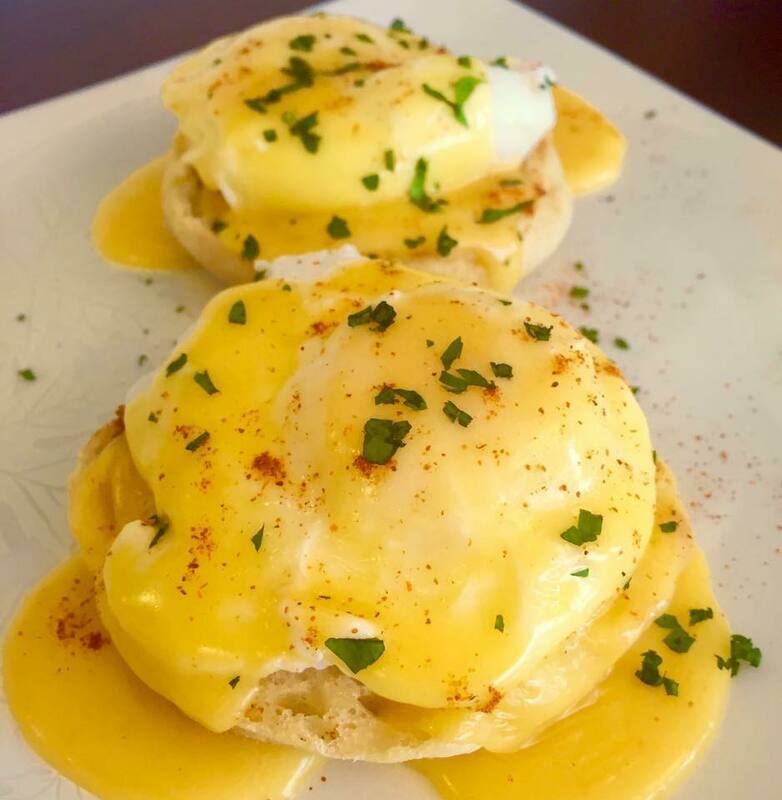 14) Arrange the poached eggs over the muffins and pour the hollandaise sauce over them. 15) Sprinkle some cayenne pepper and serve hot. N.B – Additionally a slice of beef pepperoni can also be added.